The US is set to continue being a key player in the global economy: the country has one of the world’s largest, most international and diversified economies, accounting for 11 per cent of global trade and 20 per cent of global manufacturing. Ireland and the US have a close relationship with regular dialogues on politics and economics. Approximately 600 US subsidiaries are based in Ireland. To further lower trade barriers, EU and American officials are negotiating the Transatlantic Trade and Investment Partnership (TTIP), creating further international opportunities for Irish businesses. 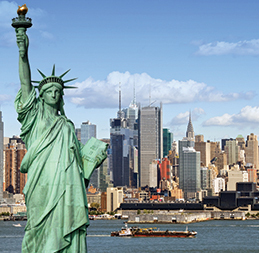 For more detailed information when trading with the USA, download our USA Fact Sheet. For an estimate of landed costs (duties, taxes and other import fees) for shipments going to USA use the free and interactive DHL Express Trade Automation Services (TAS) tool, tas.dhl.com. TAS also provides information on regulations compliance and trade documentation. Goods which are US export licensed and/or with a value exceeding US$ 2,500: formal clearance is required (goods from Canada are exempt from this limit) and an Electronic Export Information (EEI) must be filed with US Customs. Textiles, foodstuffs and drugs require formal clearance if the value exceeds US$ 250. If DHL is completing EEI filing and the shipment is moving on an Import Express account, the receiver must provide Power of Attorney (POA). US Customs levies a Merchandise Processing Fee (MPF) whenever formal clearance is completed. The MPF is levied at 0.34364%, a minimum of US$ 24 and a maximum of US$ 485. Goods may be subject to inspection by government agencies including the Food and Drug Administration (FDA). When shipping to a business: provide the receiver’s tax identification number (IRS number). When shipping to a private importer: provide the receiver’s Social Security Number (SSN). Shipper must be FDA registered. Receiver must be a licensed alcoholic beverage importer, not a private individual. Provide prior notification; fee: US$ 10. FDA entry preparation fee: US$ 20. Send bulk shipments, including intra-company transfers, as goods. State on Waybill and invoice ‘Not restricted article per IATA regulations’ – otherwise, shipment will be held until shipper or receiver can be contacted for identification. An imaged Material Data Safety Sheet (MSDS) is recommended. All shippers must be pre-approved through the Safety Department (Dangerous Goods Administration). Prescription drugs for personal use: US FDA unapproved drugs (90 day supply only) may be imported for an individual's personal use with a serious illness. Non-prescription drugs: provide name, intended use, ingredients, doses, formulations and labelling. Only send used personal effects. Provide receiver’s telephone number, flight number, arrival date, passport number and/or Social Security Number regardless of value. Personal effects valued over US$ 200: provide a completed CF3299 (declaration for free entry of personal effects) before shipping. B2B or B2C (for personal use) shipments: provide complete item description, Fabric Detail Sheet (FDS), gender (man/woman/boy/girl) and value per item needed. Shipments over US$ 2,500: provide receiver’s SSN. Commercial clothing including informal/duty free samples: must be mutilated and valued under US$ 2,500. Commercial shipments from WTO countries: Quota/Visa required. Commercial shippers: include on commercial invoice complete address of textile & apparel products manufacturer; textile declaration is not required. Receiver to provide POA. Cigars not properly labelled with country of manufacture as per US Customs regulations are subject to seizure. Cigarette shipments to unlicensed receivers will be returned to origin. Invoice must state artist’s name, year produced, edition if applicable (e.g. 1/12) and title of artwork. For ship spares and x-ray machines, please contact DHL Customs Services before shipping.